I’d spent some time reading various articles describing the construction of magnetic loop antennas. The reason for this interest was that my son (2E0KGG) had moved to a new QTH and to help get him active on one or more of the HF bands we needed an antenna design that was suitable for use indoors or on a balcony. Also around this time the station manager (XYL 🙂 ) had me sort out the garden shed and one of the items of junk to be discarded was an old bike wheel. 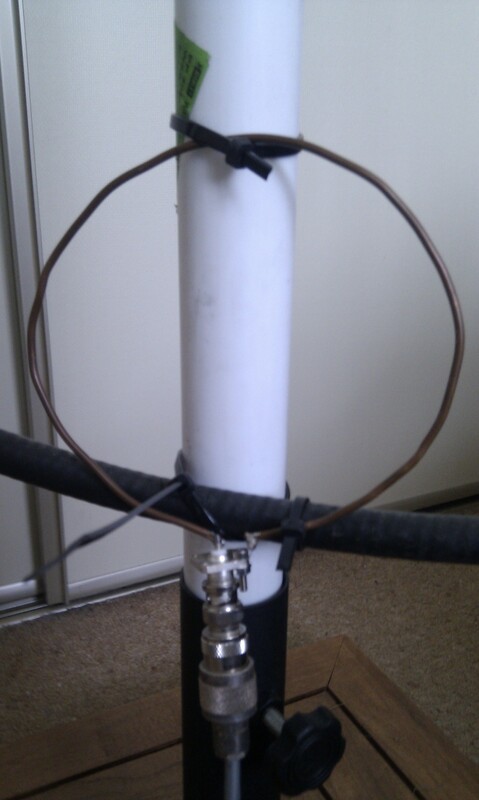 That was until I remembered the article I’d read about using an alloy rim of a bike wheel to make a loop antenna! Needless to say not all the parts of that wheel went into the skip. 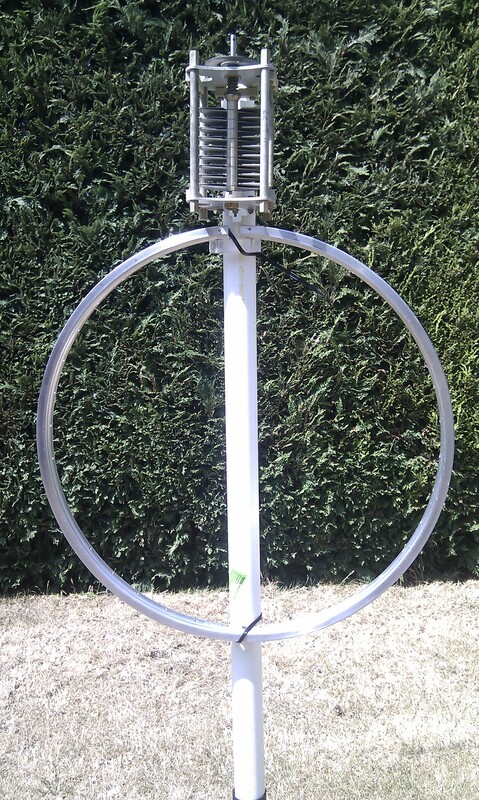 I now had something to base my first magnetic loop antenna on, what follows is the results of my experimentation, both good and bad. This is still very much a “work in progress” project and will be updated as new things occur. For mechanical strength and to maintain rigidity I used some 1/2″ thick perspex to make an insulator to bridge the slot that would be cut into the rim. Also across this would go the air-spaced capacitor. 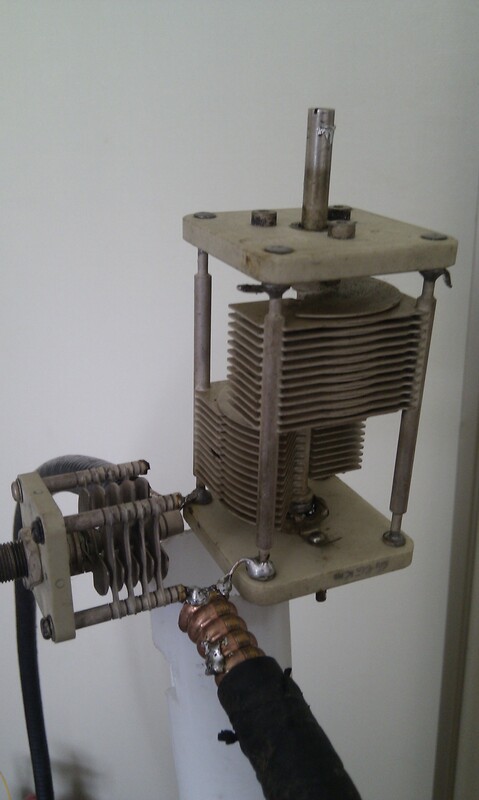 Having had a quick search of my boxes of “old radio stuff” I found a very large air spaced capacitor. Ideally I wanted a split-stator capacitor but what I found was a normal variable capacitor but it would do for an initial test. The next requirement was some form of support, here I used a length of white plastic tubing sold in DIY stores as “waste pipe” and the base off the garden parasol! 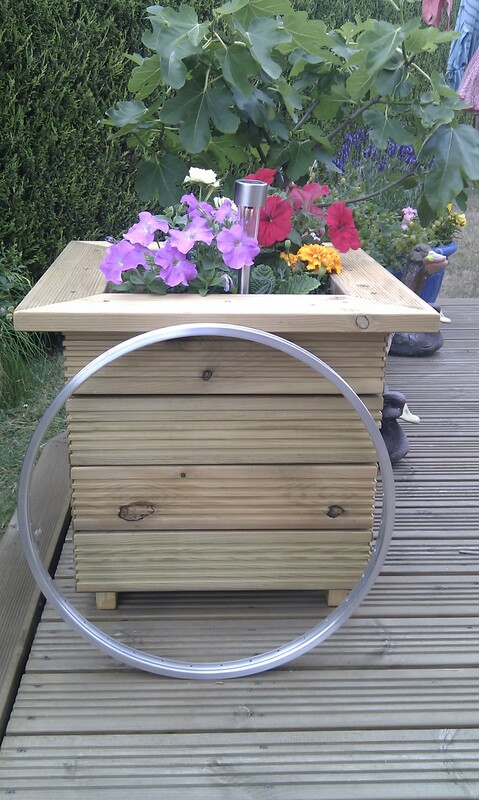 Having sorted the main loop out I then needed to make the primary feed loop. For this I used a length of RG213 to form a Faraday loop. This proved to be a little bit of challenge to join together at the top of the loop and still maintain the circular shape given the thickness of the cable. However with use of insulating tape and suitable heat shrink tubing I had something that looked good. I think those last two words were fitting for what happened when I tried the loop. Not having an antenna analyser I knew that the only way to see where the loop was resonating was to listen for a peak in receive noise so I connected the antenna to the radio and tuned to 10M. A quick swing of the capacitor resulted in no noise peak, switching to 12, 15 17 and 20M also gave the same result – it didn’t work! Having spent so much time making the Faraday loop and only having the one capacitor to hand I decided that the thing to change would be the loop. Bigger has got to be better – right? So I replaced the nice round alloy rim with a quickly hand formed 1M diameter loop made from LDF4-50 cable, I then repeated the tests and it still didn’t peak on any band!!! At this point I decided it had to be the primary coupling loop, it couldn’t be anything else. So I replaced the coupling loop with a simple loop made from 1/8th copper wire soldered directly to a BNC socket, connected this to the radio and repeated the tests. SUCCESS… the loop tuned on 3 bands. I now had something that was “working” and I could start to experiment with. I found that I could peak the receive noise but not having any form of slow motion drive the tuning was very critical so improvements were needed in that area. Digging deeper into the boxes of “old radio stuff” I eventually found two split-stator capacitors and a wide spaced butterfly capacitor which were all crying out to be used. I experimented with the two split-stator capacitors and found that one of them would allow the loop to tune from 30M through to 10M. To provide the fine tuning I connected the butterfly capacitor in parallel with split-stator capacitor. 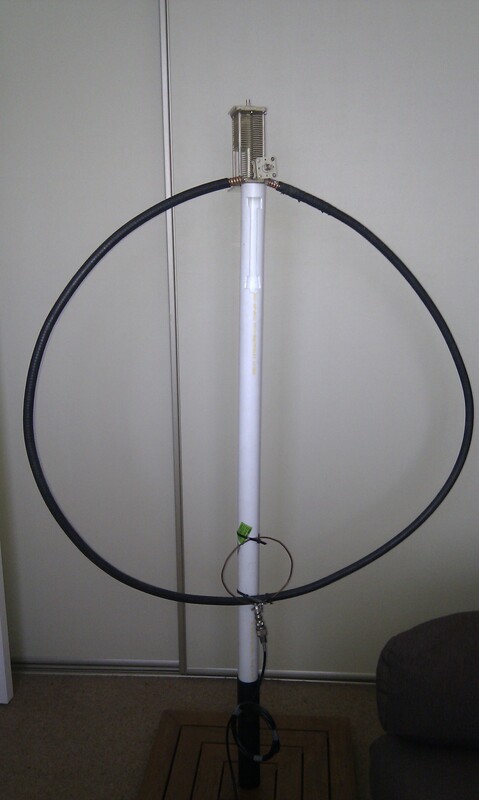 The following photos show a Magnetic Loop Antenna that is a complete lash-up in terms of the mechanical construction yet it is giving some surprising results. Tuning is very simple, the butterfly capacitor is set to 50% mesh, the large split-stator capacitor is then adjusted for peak in receive noise and then finally on transmit the butterfly capacitor is adjusted for minimum SWR. The simple wire coupling loop works across the 30M to 10M range giving an SWR better than 1.2:1 I have not experiment at all with this loop in terms of its size, positioning or shape. The final photo and gallery show the complete loop, and some of the results obtained using it inside the shack running a maximum of 5W output power to a 20M run of RG58 with a simple 5 turn RF choke before the BNC connection on the coupling loop. Improve the connections between the LDF4-50 and the capacitors using copper strip. Weather proof the tuning capacitors using a plastic enclosure. Experiment with the primary loop coupling and weather proof the feed point. Build an Arduino / RaspberryPi based control unit to remote tune the loop.